I have been searching for seeds from this plant for a long time. Does anyone know where I can find seeds of this specific orchid? Carnivore or not, I want to have a look at it myself. I may seem grumpy. I'm not. I'm just very critical about subjects I have tested and fiddled with myself. I'm always open to advice, but don't try to force me. I didn't think any were actually carnivorous? I would always challenge the possibility of an orchid being carnivorous. Why bother making a flower stalk just to end up eating the pollinators? It is a good looking orchid either way, but I don't have the tastes to really get excited about one orchid over another. Of course, there is the case of Stylidium debile, but orchids are not so prolific, and as far as I know, need cross polination, so it would not be in favor of the orchid to have carnivorous flowers. To grow an orchid from seed, you'd need to use tc, if not you'd need the specific fungus it requires to germinate which changes from species to species. 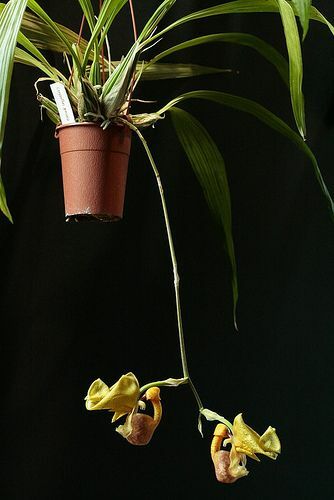 Although orchids are not carnivorous they are starting to be considered predatory regardless. This is because to germinate, it needs to consume a fungus (and continues to do so after germination) this fungus doesn't gain anything from the interaction. SFLguy wrote: To grow an orchid from seed, you'd need to use tc, if not you'd need the specific fungus it requires to germinate which changes from species to species. Although orchids are not carnivorous they are starting to be considered predatory regardless. This is because to germinate, it needs to consume a fungus (and continues to do so after germination) this fungus doesn't gain anything from the interaction. ...unless that's the one collected plant. Benurmanii wrote: I would always challenge the possibility of an orchid being carnivorous. Why bother making a flower stalk just to end up eating the pollinators? It is a good looking orchid either way, but I don't have the tastes to really get excited about one orchid over another. I have a stylidium debile, what about it? The supplier told me it isn't carnivorous, but the small tentacles with dew behind the flowers have chemicals in it to digest small bugs which have been caught just like a sundew. Still not sure if this is to prevent pests or its just straight up carnivory. Well, generally, for something to be carnivorous it needs to meet three criteria: speciallized structures for trapping, means of digestion, and nutrient pathways (absorbtion). Stylidium matches the first two, but I have yet to read or hear anything about their means of absorbing nutrients. Every carnivorous plant species I can think of produces flowers in addition to the various structures used to capture prey. The protuberances on A. liesneri (main drawing and figure C on the illustration) are what make the plant interesting, as some have speculated that they might be used to trap small insects (similar to the way a Drosera species would). Whether or not this is true remains to be determined. Like many members of Cranichideae, A. liesneri produces small (mostly white, if I remember correctly) flowers that aren't showy like most cultivated orchid species (figure D). I too would love to try my hand at growing this species, but it's true that it has only been collected once. Worse yet, there are no photos of it on the internet (trust me, I've been thorough). for this orchid see here :http://www.epidendra.org/taxones/Aracamunia/Aracamunia%20liesneri/Aracamunia%20liesneri%20PROT.pdf. BENURMANII see the DARNOWSKI book on the triggerplants you have the answer , they have digestive enzyme ,but may be not on all the genus . If you want a carnivorous orchid the only thing I can recommend is a epiphitic Utricularia. They look a lot like orchids but aren't.